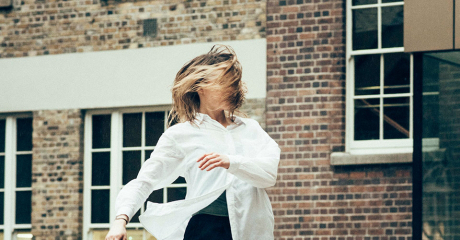 CONNECT’s Stephen Roddy has partnered with dancer and choreographer Sibéal Davitt to develop a new commission for Dance Ireland. The work will be based on Fógraím/I Proclaim which he created previously with Sibéal. Dance Ireland is the representative body for dance in Ireland. Stephen’s performance system records sounds made by a dancer during a performance and processes those recordings live to generate complex rhythmic structures and intricate melodic lines which are weaved back into the performance as it unfolds. The original work was commissioned by ‘GPO: Witness History Public Art Commission‘ and the Dublin Dance Festival and performed as one of six solos at the ‘Embodied’ event at the GPO in April 2016 to mark the centenary of the Easter Rising. Sibéal and Stephen will research and develop different sounds, musical materials and movements to determine how they might complement one another. The work will build upon a performance system developed for Fógraím/I Proclaim and which will be further developed and expanded to support a broader range of compositional and choreographic ideas. The new work will also incorporate concertina music by noted traditional musician and composer Niall Vallely as a means of deconstructing the established ‘sean-nós dance’ relationship between a dancer and an accordion player. Stephen works with Professor Linda Doyle at Trinity College Dublin where he is a member of the creative arts practices team known as the Orthogonal Methods Group.